American writer and Bologna enthusiast Mary Tolaro Noyes likes to say she has been seduced – unexpectedly – by Bologna. In 1994, Mary arrived in Bologna to study Italian so she’d be able to communicate with her Sicilian relatives, who did not speak English. She avoided more popular destinations like Florence and Rome, flooded with English-speaking people, and went for Bologna instead because she thought she would be forced to speak Italian here (she was right because she now speaks it perfectly!). 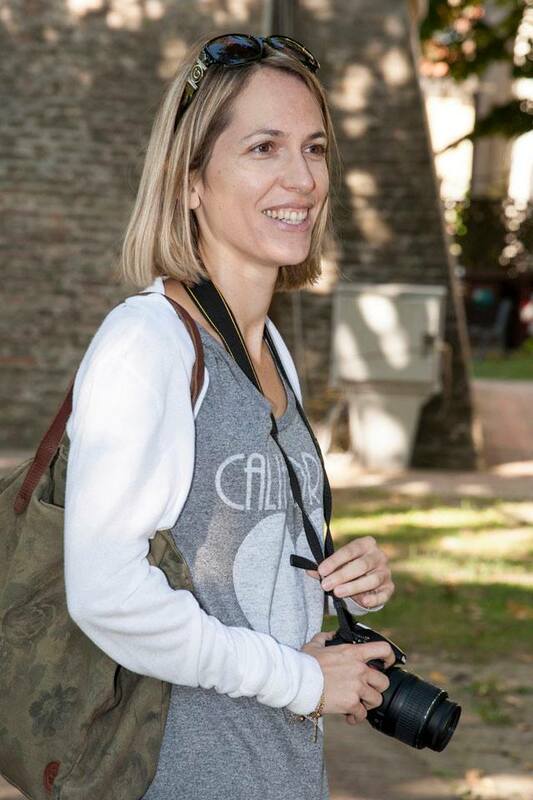 I have met Mary many times during her frequent visits to Bologna, and I have decided to interview her about her first book, “Bologna Reflections – An Uncommon Guide”, as I think it can provide with great pointers for someone looking to visit or delve deeper into the history of Bologna. Why did you decide to write a book about Bologna? I did not expect to write a book about Bologna. I had planned to write about Sicily after finding my paternal family there in 1989. I came to Bologna in 1994 to study Italian and, in the meantime, kept a journal. When early on, one of the first Internet services in the city requested me to write about Bologna in English from the American point of view, I began my historical research in earnest and have never finished. About ten years ago, I decided to organize the pieces into a collection: “Bologna Reflections – An Uncommon Guide” is the result. Why did you call it “an uncommon guide”? I call it “an uncommon guide,” after trying out many other titles in the process, because a title should give the prospective reader an idea of the book’s contents. This book was difficult to define because it is made up of itineraries for learning Bologna’s history and discovering her often hidden treasures; short chapters on history; and personal stories that demonstrate the cultural and artistic heritage and the generosity of the Bolognese people who have welcomed me. It contains my poetry and artwork by my son. The book does not tell one where to eat and sleep, etc., but encourages one to explore and to, in the end, be seduced, as I was/am by Bologna. You said during one of your presentations that two of the topics that interested you the most during your research for the book were the University of Bologna and the canals. Can you tell me about an aspect of the history of the university and of the canals that most fascinated you? As I delved deeper into the history of the university, I understood how important it was to every aspect of life in Bologna, even at its beginning in the 11th century: the medieval city’s economy, its cosmopolitan/learned nature, the development of the porticoes, to name just a few. I enjoy imagining the carousing students at the osterie, the lessons in the neighborhoods, and the cloth, paper, and book makers, who had to provide for them. As for canals, initially I became interested in the history of Bologna’s waterways because of my surprise at their discovery. Again as I continued my research, I could better understand their importance to the success of the city over time, especially its economic development. I enjoy imagining where the bridges crossed over what are now paved streets, boats carrying goods, laundry being done on the banks of the Canale del Reno, and Via Castiglione curving out of the center as a waterway instead of a narrow road packed with buses and cars. A simple answer to this question might be: I appreciate that Bologna still allows me to imagine the world as it was then, even if it is a somewhat romantic view. For me, this is magical and seductive. 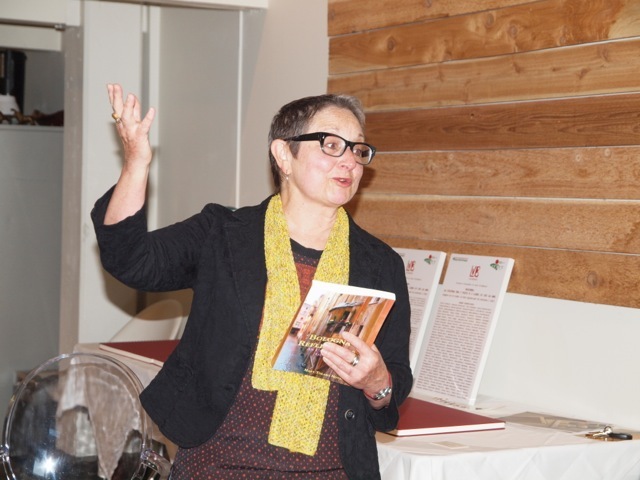 Mary demonstrating her enthusiasm for Bologna at an event in Portland for the Portland-Bologna Sister City Association. How does the Bologna of the past connect to the Bologna of the present? For me the university, the cosmopolitan nature of the people, its commerce, and the food traditions are aspects of a past that is still apparent today. The porticoes and piazzas, the towers and other monuments are physical reminders, but Bologna as a city of merchants and intellectuals, independent minded and energetic, recalls her past as well. Piazza Maggiore is always a good place to begin. You said the book is not only about Bologna, but also about the Bolognesi. What did the Bolognesi teach you about their hometown? Answering this is very difficult because it is impossible to imagine the book without the help, encouragement, and generosity of the Bolognesi. Professors gave me their research notes, many friends shared their families and lives, and introduced me to those who could help in my search beneath the surface of the modern city for clues about its past. Most of the stories in the book recount these experiences. What’s the Bolognesi’s most unique trait, as compared to Italians from other cities? Their surprise that I would write a book about their city! It seems the Bolognesi are used to living in the shadow of other famous Italian cities. Yes, we don’t mind – we like being a well-kept, lovely secret…! Thank you, Mary, for taking the time to answer my questions. 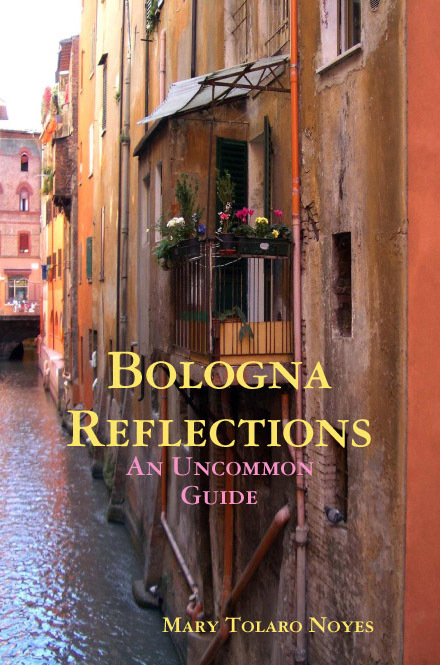 To purchase “Bologna Reflections – An Uncommon Guide”, click here. Mary’s second book, “Gathering Chestnuts – Encounters Along the Way”, a collection of stories set in Bologna and the surrounding area “recounting the many gifts given to me by wonderful individuals”, is available here. 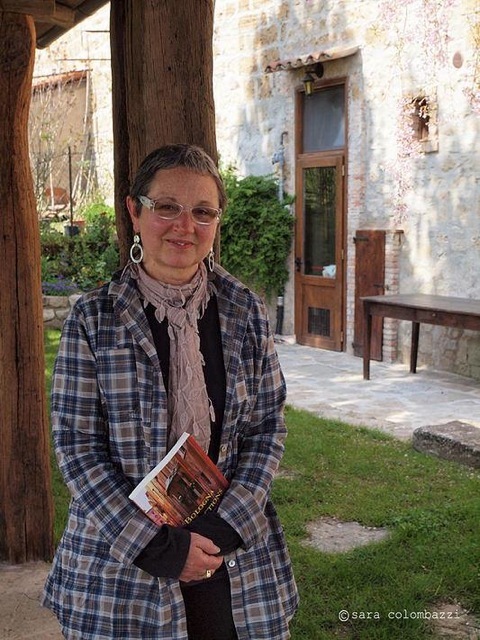 Mary also contributed a short article, ‘Enigmatic Bologna,’ to a newly released book, “Emilia-Romagna Segreta” (Secret Emilia-Romagna), where she describes, both in English and Italian, the secrets of Bologna she has discovered in the process of her 20-years of coming here.